Top row (left to right): Marie Ferrario, Robert Regalia, Barbara Reynolds, Russell Hansen, Jean DeVor, John Stanley, Sylvia Calhoun, Robert Stefanoni. Second row: Raynel Maestas, Mary Lou Callaghan, Dennis Reidy, Darlene Hachmann, Richard Dickinson, Canice Recktenwald, James Lacourcierce, Bernice Etheridge. Third row: Annabeth Rehder, Clarence Hicks, Mary Wood, Laurence Campiotti, Nina Concannon, John Biasatti, Eleanor Cernusco, Richard Guasco. Fourth row: Phillip Deitz, Warren Mermilliod, Robert Santos, Jay Michelis. Credits: From the collection of Mary (Wood) Fallin. The kids in the picture are members of the high school graduation class of 1955. 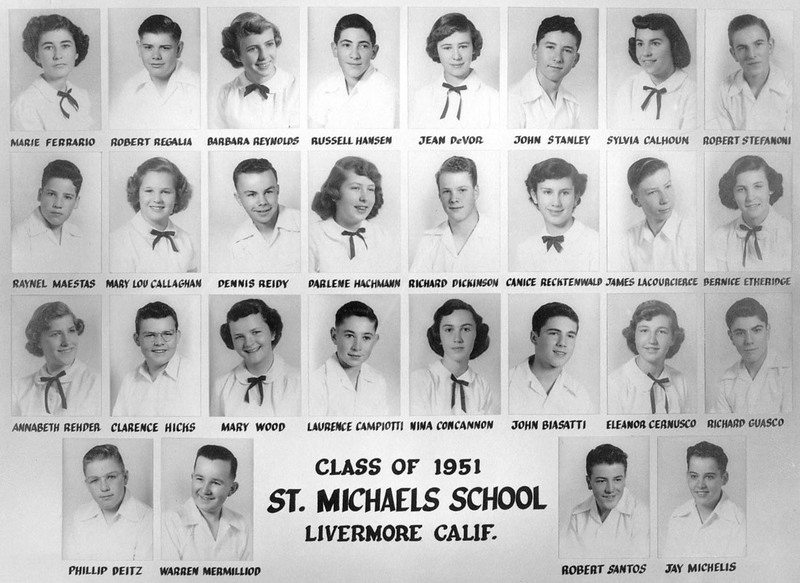 To find other pictures of the class of 1955 in the archive, see Livermore class pictures listed by year of high school graduation: 1955. And if you have any pictures of the class of 1955 that you would like to share, please submit them to the Archive.